pepperblossom decor: Give-a-way ? Okay! Something about giving stuff away is so fun! We are giving away 2 items this time!!! An accessory anyone can appreciate!! Hey and if not for you... Christmas.. Hello!! You can pick any color! So here is how you enter.. Hop on over to Silver Dapple Jewelry and let us know what your favorite Product is!! Just leave all entry's as SEPERATE comments below and you could win!! Don't forget to leave your email address so We can contact you! I am a follower! LOVE these headbands!! I am a follower! These headbands are too cute! These are so cute, I am already a follower. I'm a follower! What a great giveaway! I'm a friend on facebook! I have your button on my blog, it's on the bottom. I follow and these are oh so cute! And these are my favorite! There are a lot to choose from! I am a follower and I need to try out these headbands! http://www.etsy.com/view_listing.php?listing_id=19950361 These are my fav. Wow, love their stuff. Black rose ribbon necklace is only one of my faves. I follow!!! Super cute givaways! I am a follower! Yay, I love roses! Love the coral vintage style ring! I LOVE these headbands! I have one.. but I need MORE!! I follow! CUTE CUTE Headbands!! The new years eve crystal ball necklace is for sure my favorite silver dapple product. Beautiful! Thanks! I cant pick just one Silver Dapple item since I make them! Thanks for the link! :) I follow you already and pass it on all the time! I think its time to get a headband either way! Are you coming to my home show on Dec 5th? I am already a follower. I love your headbands. Im a follower! I would gladly post your link and add a button but i dont know how. Ha ha love the headbands! I love the Red Rose adjustable Filigree silver Ring. Love the jewelry!! The orange and teal necklace from Silver Dapple just went on my Christmas list. Hope I win! I am a fan on Facebook! 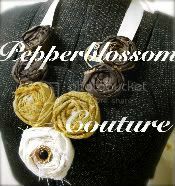 "Rob n' Ki Smith"
I love the Black Rose Ribbon Necklace! I love love love the black rose hairband!!!! would LOVE it for Christmas!! !